One of my favorite, most inspiration watercolor artists is a sweet lady that lives on the entire other side of the world from me in Mars. Debi Riley lives all the way in Perth, Australia, but because of a chance connection through WordPress and the World Wide Web, I have the joy of following her lovely work and SWOONING daily. I’m keeping my fingers crossed that she may come to the U.S. some day to visit relatives and find a way to Mars to meet and spend some time showing me how she makes such beautiful magic with paint and paper… I will cook and bake for her and serve lots of wine if only she will show me how to make such swoonable art as she does! Debi makes it look so effortless, yet when I attempt to do the same…. ARGH! No swooning! I keep reading, though, and I keep trying to absorb, and I keep laying paint on paper. 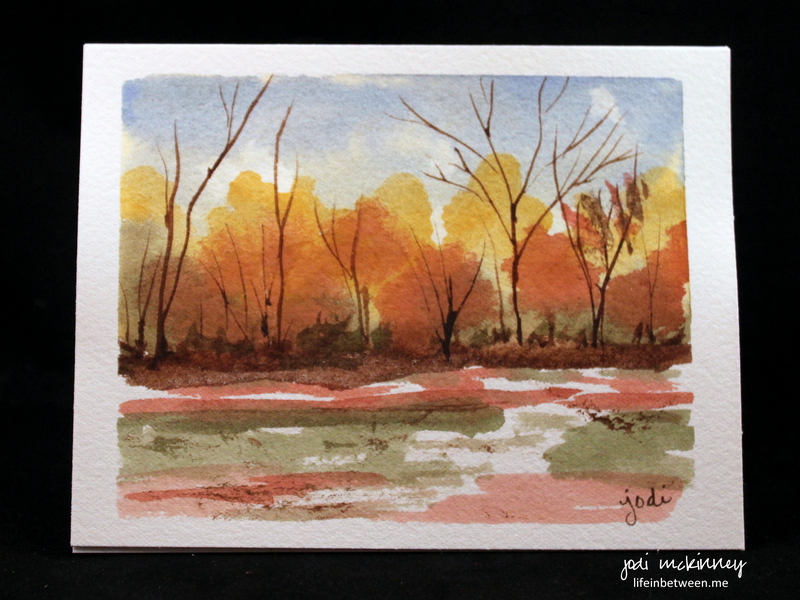 This little landscape card, came after two frustrating attempts to do a full-sized painting and not liking what happened. Then I realized I didn’t pay attention to cool colors for background and warm for foreground. After a while, do these types of things become natural? I just want to be loose and free and “do it” without thinking….. but it seems there really is a lot of discipline – even in (if not especially in) abstract art, which ends up looking so effortless. If you would like to see some truly beautiful art, please be sure to check out Debi Riley’s blog here. Debi is an award-winning creative arts instructor with over 15 years experience who works in watercolor, acrylic, oils, pastels, charcoal, mixed media, and photography. She also has a beautiful Pinterest page here. In the meantime, I’m going to keep trying, and I appreciate you humoring me by allowing me to share. Happy Tuesday! Happy Groundhog Day! Happy day to do what makes you happy… at life in between. This is really beautiful Jodi. Great post. Oh this is very swoon worthy, so very lovely! You are very kind, Cathe! This is beautiful, Jodi. It is very eye pleasing, yet jumps out at the eye in a pleasant way. Great job! Just watched (forgive the spelling) Punksatawny Phil and he didn’t see his shadow. EARLY SPRING!!! Hip hip horrah!! Yay!! I have already started making plans for spring…. 😀 (Lots of walking at the dog park with Bria and my sister and her two dogs). Your landscape is beautiful. The trees are so delicate and the colors are soft and appealing. I find watercolor such an unforgiving medium that I am always impressed with the result you achieve (even if it takes a few attempts😊) I can’t wait to check out your friend’s page. Thanks for the tip and happy Groundhog Day to you too!! Peaceful and pretty. If I saw this as a notecard I would buy it! Really Kathy? Thank YOU for making my day!! Jodi, what I don’t get is this … Your painting is gorgeous! HUH? I LOVE THIS! Dear Jodi, you have tapped into your inner Debi this morning. I love the serenity of this beautiful landscape. As Charlie says, we are now swooning over your art. I agree you are so fortunate to have found our dear friend Debi. I agree, I think you’re getting it lady! Debi is so inspirational, and a wonderful person too! Love your delicate branches and colors make me stop because they’re a bit unexpected. Nice work! LOL! 😀 You’ll do great. Have faith in yourself. Your instincts are wonderful! Thanks my sweet encouraging friend! I gave them a try just to put paint and water together – OOOOOO LA LA LA! Can’t wait to play some more! Perhaps I fibbed a little. Still, your work is not bad. I think it’s actually quite good. I will go visit her site! Lovely watercolor! Thanks Lynn! Isn’t her work amazing!?!? It’s a beautiful little watercolor, very eye-pleasing. 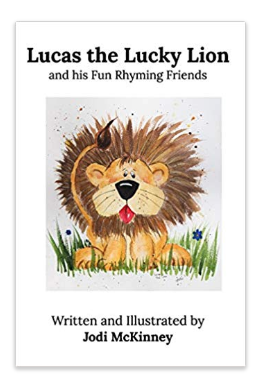 I popped over to Deb’s blog, she has some very impressive artwork! Keep up the good work! Great post, thanks for the tip. I followed your awesome Aussie! You’re way too hard on yourself, Jodi. I LOVE your watercolors! Landscapes, especially abstract, are my favorite kind of art. This is one of the best I’ve seen from you yet. Wow – thanks Carol! You all are so kind to me! I feel like an artist princess today – hahaha! Maybe you can take a field trip to Perth? Personally, I LOVE your watercolors, but thought it could be a good excuse to see some kangaroos and koalas! Oh what fun that would be cooking and painting and drinking wine – I can’t imagine anything lovelier! Hope jury duty went well. always a long day – eh? my oh my, Jodi this is wonderfully “swoon – worthy”!! what more can we want? 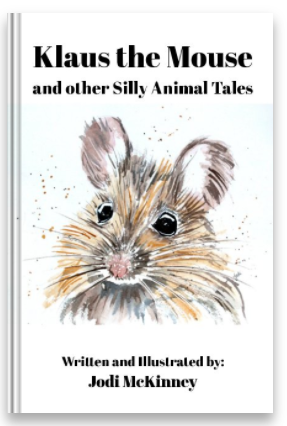 And you knew I’d love the title…. of course! Jodi, I love your art, and am so glad you share it with us. Creating any kind of art is hard, and requires a real dedication and constant desire to improve, but that’s what makes it so satisfying in the end. Even as just a writer, I can relate to this post.mmbutmplease know that some of us are swooning over YOUR art! Wonderful painting, really love your colour choice. So true Debi’s blog is fantastic, with some great tutorials, especially regarding colour. ……..we might all be over to visit, especially seeing all the lovely biscuits and more you make, yum! Oh what fun would that be!!!!!! !